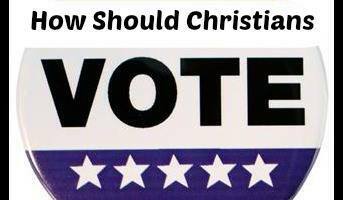 Question: "Should Orthodox Christians vote?" There are no canons of the Church that either require Christians to vote, or forbid them from doing so. There are restrictions on the involvement of clergy and monastics in political matters, but not laity... so long as they do not take positions clearly at odds with the teachings of the Church. Clergy may not run for office, and while they can and do comment on moral issues that may have a political element, they are generally not permitted to engage publicly in purely political matters. In [the] face of political differences, contradictions and struggle, the Church preaches peace and co-operation among people holding various political views. She also acknowledges the presence of various political convictions among her episcopate, clergy and laity, except for such as to lead clearly to actions contradicting the faith and moral norms of the church Tradition. The fact that the Plenitude of the Church does not participate in political struggle, in the work of political parties and in election processes does not mean her refusal to express publicly her stand on socially significant issues and to present this stand to governmental bodies in any country and on any level. This position may be expressed only by Councils, the church authorities and those empowered to act for them. In any case, the right to express it cannot be delegated to public offices or political or other secular organisations. V. 3. 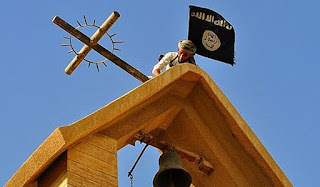 Nothing can prevent the Orthodox laity from participating in the work of legislative, executive and judicial bodies and political organisations. This involvement took place under various political systems, such as autocracy, constitutional monarchy and various forms of the republican system. 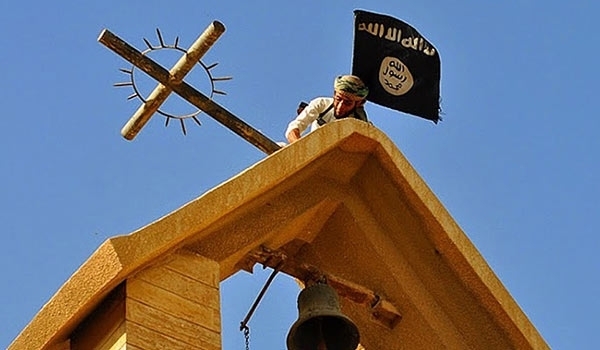 The participation of the Orthodox laity in civic and political processes was difficult only in the contexts of non-Christian rule and the regime of state atheism. In participating in government and political processes, the Orthodox laity are called to base their work on the norms of the gospel’s morality, the unity of justice and mercy (Ps. 85:10), the concern for the spiritual and material welfare of people, the love of the fatherland and the desire to transform the surrounding world according to the word of Christ. At the same time, the Christian, a politician or a statesmen, should be well aware that in historical reality and, all the more so, in the context of today’s divided and controversial society, most decisions adopted and political actions taken tend to benefit only a part of society, while restricting or infringing upon the interests and wishes of others. Many such decisions and actions are stained with sin or connivance with sin. Precisely for this reason the Orthodox politician or statesman is required to be very sensitive spiritually and morally. If we involve ourselves in politics, we are not free to take positions that are clearly opposed to the teachings of the Church. Thus, for example, it is not possible for one to be pro-abortion, and an Orthodox Christian. However, there are often complicated choices that have to be made, and the Church is not going tell people who to vote for. But one should be guided by the teachings of Scripture and Tradition, and vote -- or not vote -- according to their own consciences. As is true of all that we say and do, we should always keep in mind that we will one day have to give an account to God. May God give us all wisdom and guide us in the way that we should go. "He that reproveth a scorner getteth to himself shame: and he that rebuketh a wicked man getteth himself a blot. Reprove not a scorner, lest he hate thee: rebuke a wise man, and he will love thee" (Proverbs 9:7-8). Question: "How should we understand Proverbs 9:7-8? Are we not to reprove the scorner? Or the wicked man?" Often people take things that are said in the book of Proverbs as if they were immutable promises of God. For example, the proverb "Train up a child in the way he should go: and when he is old, he will not depart from it" (Proverbs 22:6) is often cited as it was guaranteed that if you raise your children right that they would at least eventually come to a point at which they would live according to the way that they were raised. However, a proverb is a word of wisdom that is usually going to prove to be true. This does not mean that there are no exceptions. There have been righteous people who raised their children right, but nevertheless had a child who died in rebellion against God. That does not make this proverb untrue... because generally it is true. Experience shows this to be the case. But experience also shows that there are some exceptions. Children retain free will, and despite the best Christian parenting, there are some children that rebel against their upbringing, and never repent. In this case, it is generally true that rebuking a scorner is not going to go well, because such a person is not inclined to listen to any rebuke, and generally will only heap more scorn on the person doing the rebuking, But this proverb is not a commandment. There are cases in which rebuking a scorner might be in order. But one should obviously be very cautious about it, because it is generally not a good idea. If you had a child who was a scoffer, as a parent, it would be your duty to rebuke him. Also, there may be some opportunities to say something to a scornful person that, at that particular moment, might actually be received well. If you have such a person in your life, you should pray that God would change their heart, and provide such an opportunity, and pray that God will give you the wisdom to know what to say, and when to say it. One other aspect of this proverb is that it is teaching us to accept correction. 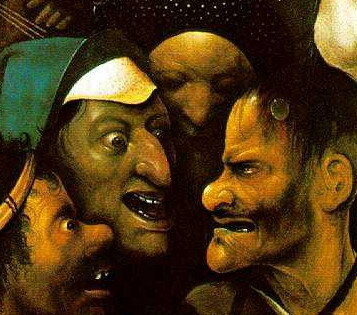 All of us at some point in our lives have been wicked, and inclined to scorn correction. But if we have any wisdom we should love those who justly rebuke us. And even when we receive what we think to be an unjust rebuke, we should consider what we are told, and seriously question whether there is in fact some justice to it. Often our enemies will tell us things about ourselves that our friends will not. They may even do it with malicious intentions, but a wise man can even learn from his enemies. Question: "When are prostrations made at the Liturgy?" We do not make prostrations at all on Sundays, with the exception being the veneration of the Cross on the third Sunday of Lent, or when the feasts of the Exaltation of the Holy Cross or the Procession of the Cross fall on a Sunday. We also do not make prostrations on feasts of the Lord (except for the veneration of Cross), regardless of what day they fall on. We do make them on great feasts of the Theotokos, unless they fall on a Sunday. 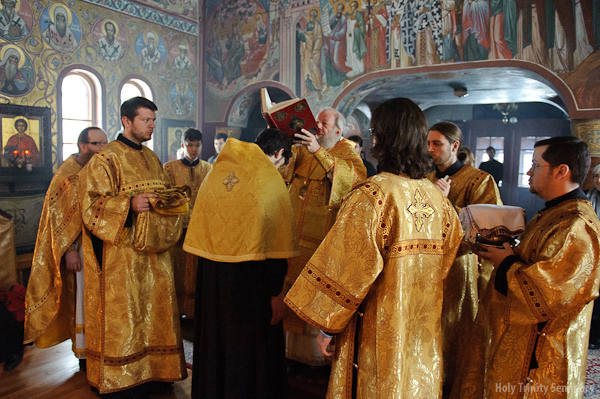 During the Church Year, we stop making prostrations after the Presanctified Liturgy on Holy Wednesday, with the only exception being the veneration of the Epitaphios (Plashchanitsa) at Holy Friday Vespers, and Holy Saturday Matins. Even though the Epitaphios remains out until just before Paschal Matins (in Russian practice), prostrations are not supposed to be done when venerating it after the Matins of Holy Saturday (which is actually served Friday evening). We do not make prostrations again until the Kneeling Vespers of Pentecost. 1. At the Anaphora, the priest or bishop says "Let us give thanks unto the Lord." 2. At the end of the hymn: "We praise Thee, we bless Thee, we give thanks unto Thee, O Lord; and we pray unto Thee, O our God." For those in the Altar who are able to hear it, this should be done when the priest or bishop says "Changing them by Thy Holy Spirit." That prayer is traditionally said in a low voice, while the hymn is being sung, and so the people usually do not hear it said. 3. At the end of the hymn to the Theotokos at the Anaphora: "It is truly meet," or its substitute (Zadostoinik). 4. When the chalice is brought out by the deacon or priest, and he says"With the fear of God and with faith, draw nigh." The clergy do not prostrate at this time, because they do this earlier in the Altar, before they commune. 5. When the chalice is shown to the people for the last time, and the priest or bishop says "Always, now and ever, and unto the ages of ages." The common practices, however, is that those who have received communion do not make a prostration at this point, and so the clergy likewise do not make a prostration. It is also a common practice in some local traditions to make a prostration when we sing the "Our Father." However, according to Archbishop Peter, St. John of Shanghai taught that this was incorrect, because, as we say just before we sing this prayer at the Liturgy, we are asking that God would enable us "with boldness and without condemnation to dare to call upon [him] the heavenly God as Father..." And a son does not prostrate himself before his father, when he has such boldness and is not under condemnation. Our government waged a phony bombing campaign against ISIS for more than a year, with the only effect being that it made it appear that we were doing something, and provided cover for what we have clearly been up to. In fact, the end result of our government’s actions was to allow these terrorists to push further west into Syria. Our government willfully "looked the other way" because it put added pressure on the legitimate Syrian government (a United Nations member). Some of the foremost academic experts in the world have repeatedly confirmed this. To the extent that ISIS has been “on the run” in recent months, this is primarily due to the efforts of the Syrian Army and their allies, and not to the half-hearted actions of our government. We should also immediately cut off all military and financial aid to “rebel” groups, which is what fueled the rapid rise of ISIS in the first place. We should end the sanctions that helped create the turmoil that laid the groundwork for this civil war. And furthermore, the US government should provide sufficient resources to rebuild the communities that have been destroyed as a result these immoral and unjust actions. We should also all continue to pray daily for the peace of Syria and for the victims of this tragic and foolish war.